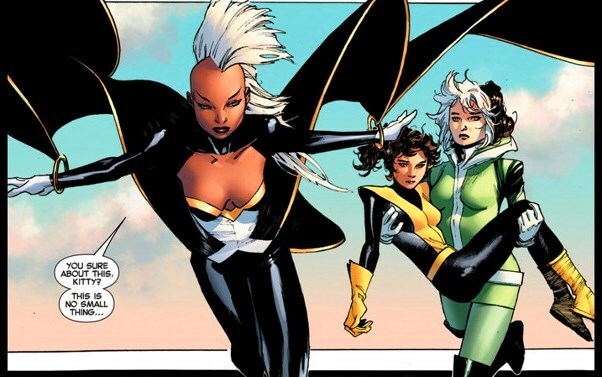 She's Fantastic: Marvel X-men Legends Infinite Series - STORM! Marvel X-men Legends Infinite Series - STORM! This figure was the bane of my existence all year. It's one thing the have a shortpacked A-list female character, it's another thing to include a major (female) Build-a-Figure piece with such a figure, and it's yet another thing to make the entire wave exclusive to a single store. To me, this figure represented the cruelty that companies like Hasbro can inflict on the collecting community. I go to Toys R Us a lot. I pass four different locations in my regular travels, and I have an additional six in close proximity that I can easily hit on the weekends. But I never saw this figure once in the stores. I promised myself that I would get her by the end of the year, and here she is, but she cost me a small fortune. This figure is stunning though. I completely understand why everyone wanted her. Plus the Jubilee legs and torso are a major bonus. I hope she gets re-released in some form so everyone can own her. This next year should be a pretty good one for X-men Legends. Let's check out Storm below! Storm's only defect in my mind is her outdated neck articulation. The big visible hinge seems unnecessary and hearkens back to the early Toy Biz days. 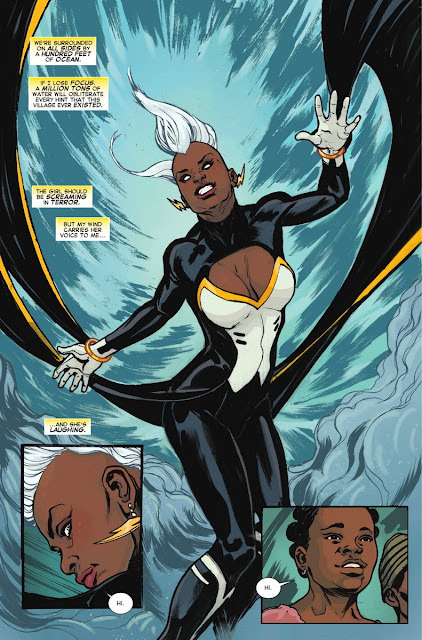 Here are some images of Storm from the comics. 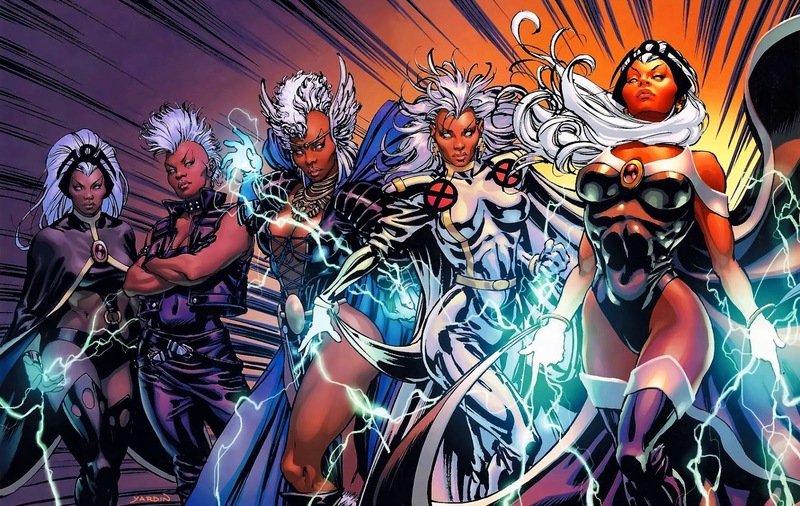 This image doesn't even represent this specific costume, but it's one of my favorite Storm images ever. Here she is with my previous favorite Storm (from Marvel Select 2012). Here she is with Medusa. they share the same body (and outdated neck articulation). And finally with the BAF Jubilee. I don't think the neck articulation is outdated at all. in fact I think it still looks 1000 times better than Toy Biz females. I never complain when we actually get neck articulation to give a decent range of motion instead of just a ball and socket that renders the joint pretty much just a swivel. Like the Ultimate Spider-man Miles Morales from the ASM 1 wave. And I would have enjoyed Captain marvel, and all the females that share that upper body, more if they had more neck articulation. They can get into much better looking flight poses with the neck hinge. I understand what you're saying, but for my personal collection, I usually have my figures posed in plain straight-forward stances. In those cases, the neck hinge is just an eyesore. I think a good mid-ground would be those double-ball-joints (the ones with an inner connecting piece that looks like a barbell). They tend to be fragile so it would be bad for figures where you want to swap the heads, but in most cases it would work well. Also, I just checked back over my recent ML figures and realized that Wasp has this same hinged neck. Maybe I just have a problem with it when it's flesh-colored. You're right about these hinges being way better than the Toy Biz joints. I still cringe when I think of the old Kitty Pryde or Elektra figures. That's fair. I usually have them in vanilla poses when I'm not taking pictures of them. I really appreciate the hinge when I'm posing them for pictures though. It does stand out a little more with the flesh tones, because as you said, Wasp has the same hinge, as well as most of the smaller female body figures like Spider-girl, Ultimate Spider-Woman, Anya Corazon Spider-Girl, etc. and I don't notice them as much as on Medusa and Storm. I desperately wanted this figure but never saw the X-Men Legends toys in Toys R Us here at all. And the after market prices are insane. Yeah the eBay prices are totally insane. I sold a bunch of stuff recently and beefed up my Paypal account so decided to treat myself. The only figures I ever saw in the TRU were Wolverine, Stryfe, and Cyclops. I hope we don't seen distribution problems like that again.